I didn’t write a word yesterday. No blog posts, no comments on blogs, no emails, and definitely no work on my novel. For shame! And why? Well, between work and then rushing home to pack up the family and get us to Supanova I didn’t have the time. You probably remember my last post lamenting being unable to attend, well T-J’s wonderful aunt Trish heard we were both upset about not attending so offered to cover our entry fee. We were so happy to go, but the real challenge would be not resorting to credit cards to buy a stack of loot. Miraculously we resisted. 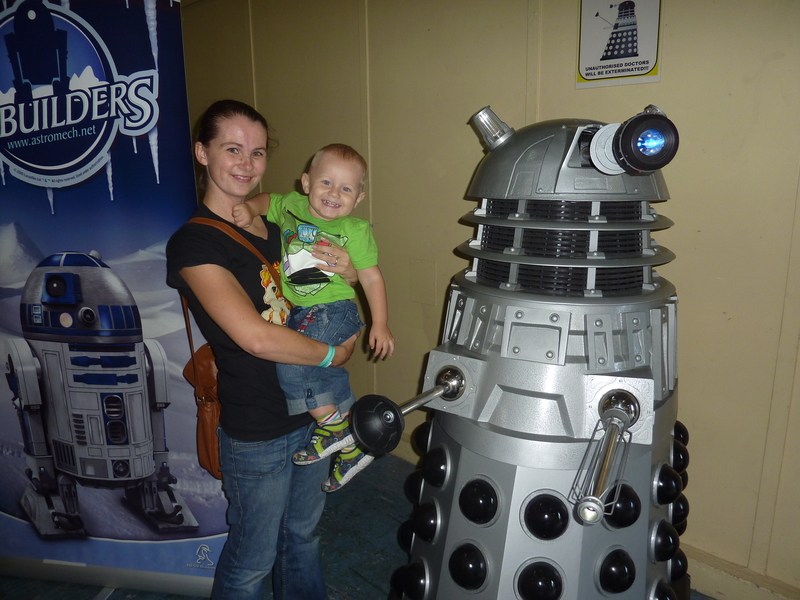 We had a lot of fun, even when T-J was stuck in line waiting for the signatures from the Futurama voice actors Xander and I had plenty of fun checking out a life size Dalek and a Tardis and dancing to the Rockband promo songs at closing time. They changed the buildings within the RNA Showgrounds they were using, which gave them more space (or at least the illusion thereof) but also caused a little confusion. On the map they provide at the door they needed to label the specific buildings a little clearer in my opinion, but we figured it out quick enough. I saw some old friends that I only ever seem to catch up with during Supanova (hi Jazz and Sly)and my ‘my little Ponyta’ shirt seemed to be a hit(everyone loves a good mash-up). I’m not certain if it was the later time or the extra space of the buildings, but we had a lot less trouble navigating the pram around. As always there was so much loot I wanted, but limited finances kept my cool Wonder Woman bag empty. Of course the cosplayers were magnificent, my favourites being the 60s TV version Batman, Robin and Batgirl and the original series cylon. I miss volunteering for the convention, but I really love attending with my family. Xander had a blast, and mummy and daddy had a good time too – without resorting to credit cards (of dooooooooom). Xander’s a better dancer than I am – sober or sozzled!